Next Stop Vegan: Making Health the First Stop in the Bronx! “I’m vegan TONIGHT!” I declared after taking a bite of my vegan chimiburger, NextStopVegan’s popular dish, a spin on the Dominican style burger. “I can get jiggy with it,” my colleague, Dondre agreed after his bite of approval. I’ve toyed with the idea of being a vegan, but I will admit that my love affair with cheese is hard to break away from (especially goat cheese!). Apparently, for Blenlly, co-owner of this Bronx-based vegan meal prep/food delivery service, I’m not the only one with “cheese deep” excuses to not fully commit. When new clients attempt to justify why they’re signing up, Blenlly quickly reminds them that this is not a transition process as much as the first step towards many health decisions. Unlike most ideas to start a restaurant or food business, NextStopVegan wasn’t born inside of a kitchen, at least one that was stateside. Thousands of miles away from the Bronx in South Korea, the beginnings of NextStopVegan started with Blenlly, who was an English teacher at the time, wanting to share vegan versions of Dominican style cuisine with her fellow colleagues and expats. At potlucks and food gatherings, Blenlly’s vegan appetizers and desserts were a total hit, being that Latin cuisine was such a rarity, to the point where her first client begged her to cook all of their meals for them until Blenlly left. “The New Yorker in me was like, yeah, I can hustle here,” Blenlly laughed. Towards the end of her tenure in South Korea, Blenlly had three clients, but the idea of starting a business back home didn’t fully stick until Ana, her sister, challenged her to meal prep and cook her meals. At the time, Ana was experiencing health issues and complications which Blenlly strongly believed a plant based diet would help alleviate. After being “hired” by her sister, Blenlly found new clients in two of her other aunts. Investing more into the prepping process for her prepped meals, Blenlly and NextStopVegan found further success after featuring their vegan sancocho on their Instagram account, which later brought in their first non-family client. “When you have a stranger sign up and they are willing to pay, you’re officially a business,” Blenlly teased. The success of NextStopVegan not only lies in the amazing food that comes out of their kitchen, the location of a former Chinese restaurant which currently operates as their prep space, but the philosophy and business logic of starting as a meal prep/delivery service. Blenlly, to her and her team’s credit, are also helping to redefine the food business as a whole in the Bronx. When asked about the decision to start a meal prep business over a stand alone restaurant, Blenlly quickly noted that the importance to a successful business is in presenting opportunities for customers, new and old, to get to know you and become loyal to you, particularly when you are challenging the notion of “healthy food” or vegan food “with a Dominican twist”, Blenlly states. NextStopVegan recently celebrated their one year anniversary. 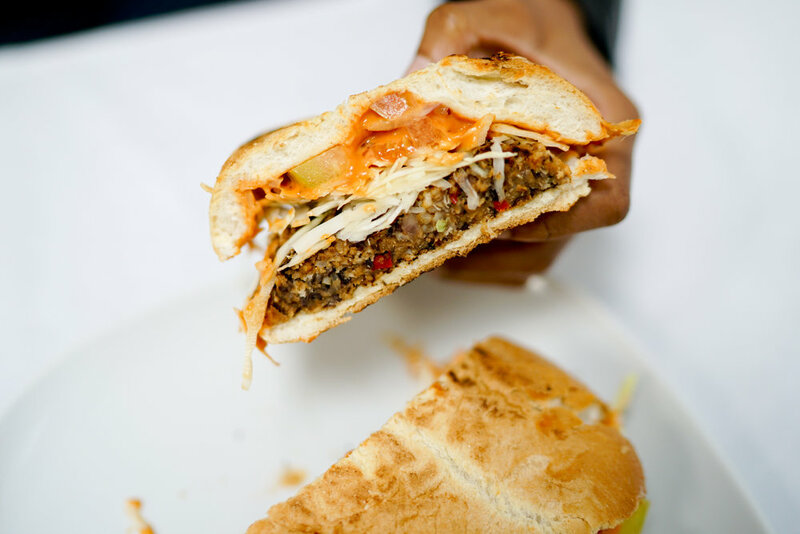 The summer brought in much success for the team as they were a part of the BronxNightMarket since the beginning, exposing the borough to not only delicious vegan Dominican style food, but to a philosophy that healthy living and eating right doesn’t have to come at a sacrifice. Their appreciation towards their clients is solid, as they frequently repost client stories on their Instagram, allowing followers to relive or capture the experience of receiving and unpackaging one’s meals for the week. To learn more about NextStopVegan, be sure to follow them on Instagram: @NextStopVegan.